Onions are a hardy vegetable that grow best in cool weather. When planting onions, you have 3 options–seeds, sets, and transplants. Start seeds indoors 10 weeks before the frost date, but I suggest purchasing sets or transplants. Plant onion sets outside as soon as you can work the soil, about 8 weeks before the frost date. These look like dry mini-onions. Plant them pointy side up. The smallest sets can be planted every 4-6″ (4 or 9 per square foot) to grow into mature onions. Plant the bigger onion sets every 3″ (16 per square) to grow green onions. For onion transplants, harden off and transplant outside 4 weeks before the frost date. Onions can be planted in the fall only in frost-free areas. Onions grows best in a rich soil; amend with lots of compost and fertilizer (chemical or organic) at planting and twice during the season. Fertilizer: 16-16-8 at planting, 21-0-0 when onions are 6″ tall, and again when they are 12″ tall. Avoid fertilizing within a month of harvest. Harvest green onions anytime after they reach 6″. For mature and storage onions wait until about half the tops turn brown and fall over, then carefully bend the rest over and let them sit for a few more days. Pull them out and let them “cure” for at least a week to allow the outer skins to dry out. Store in a very cool (but not freezing), dry place. Check out this fun way to store onions! Tina–you can plant 16 per square and thin them down to 9 or 4 by using them as green onions. You can even cut the bulb and roots off, replant it, and it will grow again. The problem with totally replanting is that storing onions take a long time to develop. How do you grow shallots? I planted my onion sets and had put 16 in one square not realizing I should have done less for full onions. Those onions grew super fast, so since I had so many together I pulled them up today for green onions. I have a couple questions now: 1. Can I plant more onion sets in that same square for full onions later? 2. I pulled the bulb off the green and am wondering if I should use the little onion bulb that came off? Diane–I’ve never made compost tea, but I would use it as an all purpose fertilizing boost, but I don’t believe it has enough N-P-K to consider it “fertilizer”. Some plants will need additional sources of particular nutrients, so you should find organic options (blood meal, bone meal, fish meal, soybean meal, etc.). Some of the gardening forums recommend against planting sets though many of the university extensions mention nothing about this. The reason is that sets tend to bolt fast. You can plant seeds, sets or plants once you can work the soil. Onion plants are very hardy and will survive down to 20º. I have pulled a few up and there are no actual onions. Do I just wait? Is this normal? Any and all answers are helpful; I am lost here. It will kill the plant if you harvest just the green tops. The way to use them is to pull the entire plant–they will look similar to green onions in the store. That is why you can plant up to 16 per square foot, then thin them down to 4 per square by using them as green onions. If I harvest the green tops of my onion sets (which are now about 7′ tall), will it kill the bulb, or can I harvest the tops continuously and then harvest the onion bulb itself at the end of the season? I think they are sprouting–all conditions must have been perfect! Hurray! Thanks so much for the tips!! I just planted mine a few days ago and I already see green shoots coming up – could they be sprouting already?? I’ve planted both yellow and red starts. Yippee!!!! For Heather and her leggy cabbage & broccoli plants, they do well to be transplanted deeper than they were in their flat cells. I typically plant them about half way up the stem. They like tomatoes will root on the stem. What a great site! I was trying to figure out when to plant my onion seedlings outside and I came across your site. Love it! I’m also square foot gardening on my little lot in NE Ohio. Good to know–those transplants are significantly bigger than seeds started indoors. Sounds like they are frost-hardy and perhaps can be planted at the same time as sets. How close to plant depends on what you want–green onions? Plant 1″ apart. 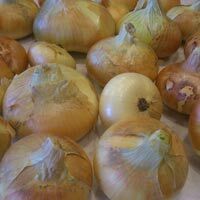 If you want bigger onions for storage, plant them 4″ apart (for square foot gardening, that is 9 per square). If they are a variety that gets really big, try 6″ apart. As for broccoli, see the Veggies tab, or click http://www.mysquarefootgarden.net/veggies to read about when to plant broccoli. I guess the onions that I bought are the transplants. They look like miniature green onions and the guy at Anderson’s seed said they could be planted outside right now with no problem. But how close together should I plant them? ALso, can broccoli be planted outside right now? I know peas can. It all depends on how bad they are. Some plants (like tomatoes) aren’t such a problem when they are leggy–you can just bury them deeper. I’m not sure if that works for those in the cabbage family. When starting seeds inside, it’s my experience that you need to keep the lights quite close to the top of the plants, or they will get too tall (aka “leggy”). When mine first pop up and I need to thin them, I often choose to keep a smaller plant. At first I thought “bigger is better” or “bigger is stronger” but sometimes “bigger is leggier” (wow, is that a word?). Depending on what week you’re on, you might want to start over with new seeds. Or, you can just try planting the ones you’ve grown. If they don’t work well (you will know within a week or two of transplanting into your garden), you can always go buy some starts and use those. I can’t suggest it enough–a call to your local extension office is often helpful. This is only my third year gardening, and though I love to research books and the internet, nothing compares with the wisdom that comes from years of gardening! My broccoli, cauliflower and cabbage seedlings came up great, but they are now very tall and leggy. I have kinda figured out that it has happened because my light was not sufficient. Do you have any ideas for them, or will they just be lost?? The bundle of onions you are describing are called transplants. Honestly, I didn’t find any definitive advice on when to plant these. It makes sense to me that the sets (little bulbs) can tolerate the possible frost they will encounter if planted 8 weeks before the frost date. I’m not so sure about purchased transplants. I don’t know how cold-hardy they are. Again, I would direct you to your local extension office. Please let us know what you find out. If I find a good answer, I’ll edit the post to include it! Onions sets should look like mini-onions, dry, compact and no bigger than a quarter. When they sprout they have a little shoot (sometimes green) coming out of the top. I’m not sure if you are describing that, or onion transplants which look like short green onions you would buy at the grocery store. They often come in 4-packs in dirt. If you are talking about sets and yours have 6 inch sprouts, I’m not sure if they will work. Call your local extension office. http://www.extension.org If you have transplants, they are just fine! What about planting the little bundle of onions. When can you plant those. We got 40 from Anderson Seed in Logan and I forgot to ask when you can plant them. They are not sets and they aren’t seeds. I’m thinking they are the transplants? I just bought onion sets today and i’m wondering what a sprouted onion looks like. Does it have roots on the white part? The ones I got have roots and the green stems are about 6 in. long. Are these any good? Also, i’m up here in logan, and they said that onion, peas, and broccoli can be planted in the ground right now. Do you think that’s too early? Cool website. I’m doing SFG for the first time this year. I built two 4×8 beds (yes, I guess I’m ambitious). I’m in an orange area, today I planted onion seeds. I’ve never grown onions before. After reading this post, I’m interested in seeing how mine do. I don’t think those sets will last a year. My guess is they will sprout. I think your best bet is to find a friend planting onions and split the cost, or just give them to someone who will use them. It does seem silly that they give you 100! Thanks for the information. That really helps out. What can we do with the left over sets? Will the still be good for next year or do we need to start fresh every year?